Relish. Dip. Whatever you call it, Thai nam prik (น้ำพริก RTGS: nam phrik), in my opinion, has remained the most mysterious type of Thai food among foreigners. And I don’t blame them. Thai restaurants outside Thailand, except those that cater primarily to Thai expats, don’t have relishes on their menus, so those whose exposure to Thai food is solely through their local Thai restaurants can forget about this. Those who know Thai food through street or restaurant foods on their brief visits to Thailand usually don’t know about dishes in this category to even look for them. I’ll even go as far as saying that even foreign expats who have lived in Thailand for years, except for the most adventurous few, barely scratch the surface when it comes to their knowledge and experience of Thai nam prik dishes. And those who live with Thai people? Well, I have periodically received emails from Thai readers asking for advice on what to do to get their non-Thai spouses to go anywhere near these relishes (like I have any clue how to do that …). But it doesn’t matter. If you’re a Thai food enthusiast, it will benefit you greatly to be familiar with dishes in the nam prik category. Even if you try some of these and end up hating every single one of them (nothing wrong with that), at least just knowing about them and how they roll will increase your understanding of Thai cuisine exponentially. 1. Relishes are among the oldest, most traditional foods among the inhabitants of present day Thailand. (I’ll expound on this with supporting evidence in a later post.) Along with rice and freshwater animals — even before chilies were introduced to us via foreign traders — we’d eaten seasoning pastes and all kinds of concoctions made with local herbs and peppercorns which became the prototypes of relishes, dips, and pastes that we know today. In other words, if you think of “authentic” Thai food as food from ancient times (implication: before they were all messed up by “kids these days” — a notion I don’t necessarily agree with), it doesn’t get any more authentic than this. 2. Relishes form the largest group of dishes in Thai cuisine. No doubt about that. The late M.R. Kukrit Pramoj, statesman and prolific writer, has presented the idea of how incredibly vast this category of dishes is in the form of a parody of One Thousand and One Nights. In this version, our Scheherazade is a young consort of an imaginary Thai king who lived in ancient times, and she, if you’re familiar with the plot, saved her life not by telling stories but sharing Thai recipes. Wisely, she told the king she would begin with nam prik. I guess you can see now how the story ends. In case you were wondering just how many types of relish there are in the Thai repertoire, this should clarify the issue. 3. Thai relishes make you attractive. This is fact. This is objective. Here’s solid proof. 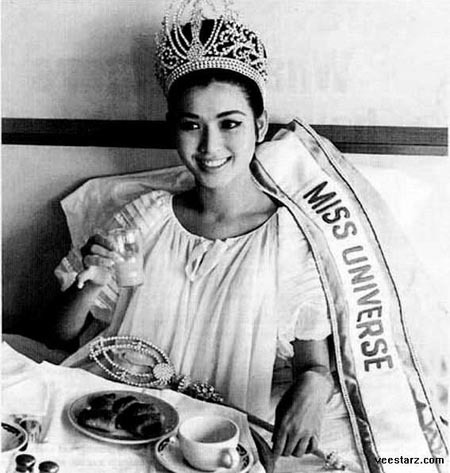 When she was freshly crowned Miss Universe (Thailand’s first win) in 1965, Apasra Hongsakula, when asked what she liked to eat the most, said she loved chili relishes. It’s the answer that endeared her to the Thai people instantly. And she’s beautiful. I’ve introduced nam prik pao (น้ำพริกเผา RTGS: nam phrik phao) to you earlier as it is the most well known and consumed — not to mention the most novice-friendly — relish worldwide. But in the next several months, we will explore other less friendly and more obscure chili relishes together. Not today, though. Today we’re learning how to eat these relishes. It will not make any sense to learn about relishes without knowing first how they fit into a typical Thai meal and how to eat them. Relishes, like most Thai dishes, are meant to be eaten with rice. You need a plate of rice — your blank canvas, if you will. Those who have written me asking why I don’t have recipes for seasoned rice to eat with Thai food, this is your answer: the best rice to eat with a typical Thai meal is plain white rice. Trust me, you’re not improving a Thai meal by pre-seasoning your rice. A relish set (shown in the cover photo at the very top) can be served as part of a larger meal; it can also be a complete meal. Today we’re eating nothing but rice and this relish set. After all, a relish is a complete dish unto itself, in my opinion. This is why we don’t consider relishes ‘condiments’. In other words, a relish is a dish, not a seasoning sauce or a dipping sauce. First, you take a little bit of the relish and put it on your rice. Relishes come in different forms. Some are salsa-like; some that contain fish flakes (such as this one) are saucy and cottony; some are pasty; some come in duqqa-like coarse powder form. The Thai people who are familiar with different relishes instinctively know which ones can be eaten liberally in each bite and which ones are more concentrated and intense and need to be approached more cautiously. If you’re a novice, always start out with just a dab. This one you’re looking at, nam prik pla tu (น้ำพริกปลาทู RTGS: nam phrik pla thu), is a mixture of grilled Thai short-bodied mackerels, grilled chilies, and some herbs. It’s one of the milder ones. To khluk (คลุก) is, roughly speaking, to mix something into something else thoroughly. This verb is usually used in the context of cooking — most often in the context of mixing a dish with rice. Relishes are almost always khlukked into rice. In the old days, this was done by hand. Modern day khlukking is done with a spoon in your right hand and a fork in your left hand. No way around it. We don’t eat rice with just a fork in the dominant hand either. You can’t khluk properly that way. Relishes are usually served with lots of raw and steamed or blanched vegetables on the side. So take your pick. Vegetable-relish pairing is just about as fun as food-wine pairing. You pair this mackerel chili relish with cucumber, you get one taste. You pair the same relish with a different vegetable, you get another taste. So much fun. For the next bite, since you’re in a mood for crunchy vegetables, you follow the cucumber bite with a variety of Thai eggplant that’s usually eaten raw alongside a relish. These little eggplants are great. Crunchy. Slightly bitter. Lush fruity bouquet with gentle hints of ripe bananas and toasted coffee. Clean and crisp with a long finish. Oh, wait. But, hey, we got a fried Thai short-bodied mackerel in the relish set too. Anyway, to get a piece of fish from the set, you also use your spoon and fork to fillet the fish. Then you eat that piece of fish along with a few bites of rice that has already been khlukked with the relish. Apparently, you can’t decide which vegetable to eat with this bite. Is that why you have a piece of blanched bamboo shoot and a Thai round eggplant on the plate, you vegetable hoarder? See, if you are dealing with one of the more concentrated and spicier relish pastes, you would want to stick with khlukking your relish with your rice. It’s the only way to balance things out: mixing a little bit of something very intense in flavor with a lot of something bland. But in this case, after a few bites, I, I mean, you have already figured out that, hey, this mackerel-based relish isn’t that spicy. So instead of khlukking it into your rice, you’re getting bolder and taking it straight. You just drop a spoonful of it on a piece of acacia omelet (you’ve seen this in my kaeng som post) and take it all in one big bite. Mmm. At the end of the meal, this is what’s left of the relish set. Then you do what the Thai people do to mark the end of a meal properly: you arrange your spoon and your fork in the manner shown above. This is not part of how to eat relishes per se; this is more about Thai table etiquette. Have you noticed that when you’re eating at a Thai restaurant (especially in Thailand), even when you’ve finished your meal long time ago, the server still seems hesitant to clear your table? That could be because your spoon and fork aren’t arranged in this fashion. Anyway, by this time, you’re already more attractive (if that’s even possible). Can you feel it? M.R. Kukrit Pramoj, Nam Phrik (Bangkok: Dokya Press, 2010), 11. Prayun Uluchada, Ahan Rot Wiset Khong Khon Bo-ran “Delicacies of the Old Days” (Bangkok: Sangdad Press, 2002), 159. I really like the way your present your points !!! Great post! Very informative and it contains wonderful information for foreigners wanting to learn more about Thai food and culture. Thank you! What an amazing post, I felt like I was on a journey. You write beautifully, and now I want some of that mackerel relish… I never knew about the fork and spoon, now I feel silly for always eating with chopsticks at the Thai places here in NYC. Thanks for an awesome post! This article is pretty vague on the use of a fork. Above it seems to indicate that a fork is used as in western meals, but this is not the case…. Thais are not that stupid. The main utensil is the spoon, which is used to eat with. The fork more as a knife is used in western utensils to herd the food onto the spoon. The knife is not used at the Thai table since a knife is not good to have at the table (it is a fighting instrument). i had totally forgotten about this! i remember chowing on this when we lived in bangkok, my nanny would serve it to us when the parents were out and she didn’t feel like cooking something up. i can’t say i loved it, but it wasn’t terrible. where can i get this or how can i prepare it? PS. dw and i are planning a major trip to thailand spring 2014. we are so SO EXCITED. Oh! How helpful! And appetizing! Thank you! The nam prik dishes are probably the most ubiquitous food you will find in Thailand but will hardly find available in occidental countries. I had a girlfriend from the North and the one from the South. They were nam prik fiends and liked to make it. They used to actually get quite a lot of satisfaction in making it themselves even though you could easily buy it anywhere. I sampled many types, but not by choice, though there are quite a few I enjoy. I don’t care for anything that was bug or pla ra induced nam prik, so I wouldn’t have tried any of the Isaan delicacies on purpose, but I am sure I have eaten them without knowing what they were. In some instances, I would look at a nam prik and think it would be taste great, but be disappointed. Yeah, I no longer have the girlfriend from either the North or the South. But I have learned some things from all my Thai food adventures, relationships with Thai women and from the Buddha: Praise the food when you like it, appreciate the effort, and if you hate it, don’t say anything offensive or express disappointment. Just be gracious. Fantastic, fun post. The song in particular was a great touch. I’ve messed around with nam prik’s in the past with varying levels of success. I had a lightly breaded (maybe egg washed?) fried pla tuu last time I was in Thailand with a milder nam prik gapi. The pla tuu, which I ordered really just for street cred, was so good that I’ve been left perpetually frustrated that I can’t find them here in the SF Bay Area. Any ideas?? You should be able to find pla tu very easily in SF Bay Area. Check out the freezer section of any well-stocked Asian grocery store and look for frozen pla tu. For instructions on how to thaw and cook them, check out my reply to Piers below. So can you recap when we ARE supposed to use chopsticks. I have never used or seen chopsticks at the Thai restaurants I’ve been to. Or are these restaurants just too Americanized? Like I said in the post, the only exception to the spoon and fork rule is when you eat noodle soups in which case you use chopsticks. For noodle dishes that are served on a plate (e.g. pad thai, pad see-ew), you still use a spoon and a fork. Thank you! I absolutely love your website. I look forward to my emails each time with your do’s and don’ts and fabulous recipes! I was taught that in the officers training school in the Indian Army. So I assume it is an English Custom rather than Thai. PS. I am from Kerala, We use a lot of coconut & Bird eye chilies. We call; it “Kandari”. I find your food a balance between ours & chineese. Vijay, interesting, although the sentence I wrote doesn’t necessarily suggest that this is something unique to the Thai people (as in we’re the only culture in the world that does it) — just that it’s what we do. Other cultures may do this too; they’re just not the focus of this article. Vijay, it’s very insightful that you find Thai food to be a mixture of Indian and Chinese! I’ve always learned that Thai food, and really most Southeast Asian cuisines, are just that, a mixture of Indian and Chinese cooking methods using Southeast Asian ingredients! I had no idea that bird’s eye chilies were used in Indian cooking. Is it just in Kerala? Thanks for this post. I’ve been in Chiang Mai for the past 5 months and these kind of tips are invaluable! I’ve made this at home with English Mackerel. It was juicy and delicious, but not like the pla thu I’ve had in Thailand. I can buy frozen pla thu in Chinatown, but I don’t know the best way of defrosting and cooking it. Any tips, Leela? Those mackerels are related to pla tu, but, no, as you’ve already figured out, they’re not the same. I, too, buy my frozen pla tu from Chinatown. It’s the only place where I can find them. All you have to do is let them thaw overnight in the fridge or a few hours on the countertop. Then blot them thoroughly dry with paper towel, making sure there is no liquid inside the cavity and none on the surface, before frying them. When you fry them, don’t deep-fry but pan-fry. Make sure the oil comes up to half the thickness of the fish. Frozen pla tu has already been cooked, so you by pan-frying them, you’re merely heating them through and crisping up the skins. Khun Leela. Since my return from Thailand, I have become addicted to the Nam Prik Kapi sauce. I put a spoonful of this sauce on everything, like fried eggs (kai jiao), fried Zucchini, fried fish, and practically on everything that is deep-fried. In front of one of the Thai grocery stores in Los Angeles, there is a lady that sells authentic home made Nam Prik Kapi in small tubs for $5.00 a tub. This sauce is heavy on the garlic as well the Priki-Nu pepper. The Priki-Nu that the lady uses will burn both your ends, but I love it. For some, the garlic taste and smell may last a while and I recommend if you want to kiss your partner to stay away from the Nam Prik Kapi. Thank you, Khob Khun Mak. this is my comfort food. alway feels like ive had a good workout after eating this because im just soaked in sweat from head to toe. love it good post . Nice post! lovely illustration too! 1. Relishes are among the oldest, most traditional foods among the inhabitants of present day Thailand. I would go out on a limb here and say that they are the oldest, most traditional food from the Thai culture… Originating first with the Mon people residing in the central planes area even before the concept of Thai people existed. The above sounds to me like an very primitive type of ‘Lon’ Tao jiew, without the use of chilies these were probably the very first types of relish eaten prior to the arrival of europeans. Therefore I think the term ‘Nahm prik’ is much later as some of the earlier versions of ‘Lon’ do not contain chilies or peppercorns, perhaps ‘Kreung jim’ is a agreeable substitute in that instance. “the inhabitants of present day Thailand” is not indicative of any particular group — just human beings who inhabited the area that has come to be presently known as Thailand. In other words, even before the emergence of the Mon. I have some thoughts and initial responses regarding that quote, but I’ll hold off on that as I’d like to know whether Thompson provides any citations from primary sources. Any footnotes? End notes? Anything? nothing in terms of footnotes or citation by the text.. but a look in the bibliography…. lists about 50 books mostly texts about the history of Thailand…… makes it difficult to know ..
something else that comes to mind is an old nahm prik kapi recipe ( probably the first recipe of thai food ever written in english) although i can’t be sure how accurate it is…nutmeg in nam prik gapi? goodness me! Anyway, it’s an interesting read. A favourite condiment is the kapi, which is made of shrimps pressed into a paste, and salted after the first stage of putrefaction has commenced…. They mix with all their stews a certain paste made of rotten prawns, called capy in Thai… which has a pungent smell that nauseates anyone not accustomed to it. It is said to give meat a certain zest which whets the appetite… so that to make a good sauce in the Siamese manner salt, pepper, ginger, cinnamon, cloves, garlic, white onions, nutmeg and several strongly flavoured herbs must be mixed in considerable quantities with this shrimp paste. Simon de la Loubère also wrote about the same thing, I believe. Don’t have the book with me, so can’t give you the exact quote. As for the “recipe” here, I’d take it with a grain of salt. These were chroniclers/historians/diplomats/traders, not necessarily cooks, and they wrote according to their perspective. Some records are better than none, but I wouldn’t readily assume these statements as facts. Also, this sounds to me like a paste for something similar to massaman curry than shrimp paste relish (the Thai have adapted massaman by adding our fresh herbs and kapi to it). This is based on 1. the reference to “stews” and 2. Thais hardly ever use dried spices in table nam prik– let along a whole bunch of Middle Eastern/South Asian spices like what’s listed there. Thanks for your insight, it never occurred to me that it could be a massamun recipe! here’s an nahm prik kapi one for good measure! they flavor it with kapick, a sort of rotten fish, of which all Siamese are inordinately fond. It is unrivalled in strength of fragrance and flavor. … A sauce called nam-prik is used by all classes in Siam. It is prepared by bruising a quantity of red pepper in a mortar to which are added kapi (paste of shrimps or prawns), black pepper, garlic and onions.These being throughly mixed, a small quantity of brine and citron-juice is added. Ginger, tamarinds and gourd seeds are also employed. The nam-phrik is one of the most appetite-exciting condiments. Just out of interest, do u think a ‘nam prik’ must contain chilies? if so…. then it couldn’t have existed before 1511. To my knowledge, I can’t recall any nam prik without the use of chilies… Could it have been possible that most the the Sukhothai & the beginning of Ayutthaya era, nam prik didn’t exist? Thanks, Pete. Yeah, that sounds more like nam prik kapi, although — ginger? Is it possible both Gervaise and Bowring mistook galangal for ginger? Also, what gourd seeds could those be? I’m wondering whether those were round eggplant (มะเขือเปราะ) seeds he saw (you know how some people pound round eggplants into nam prik kapi). I was going to say those could be the seeds of pea eggplants (มะเขือพวง), but there’s no way anyone could confuse those little itty bitty things for gourds. Must nam prik contain chilies? In my opinion, no. For example, the base paste for neither kaeng liang nor tom som (pla krabok) contains chilies. There are other examples, I’m sure. However, nam prik must contain “prik.” And the word prik doesn’t exclusively refer to chilies; it also applies to our indigenous “prik”: peppercorns (both of the previously mentioned kaeng pastes contain peppercorns). We had been using peppercorns long before the arrival of chilies (archaeological evidence dates back to as far as 9 millennia ago). Hence the name “prik thai” to differentiate them from the other kinds of prik (“prik thet พริกเทศ” is implied). So it’s possible that we had some sorts of nam prik long before the arrival of chilies through foreign traders. In fact, I believe we did. I bought a skewer of grilled chicken hearts from a street vendor in Bangkok. There was a tray of raw veg and a nam prik containing red fermented bean curd. It was delicious – one for the cookbook Leela! Piers, I honestly can’t think of any red fermented bean curd-based nam prik that’s served with grilled chicken and raw vegetables? Where exactly is this street food cart located? I need to check it out. Also, can you be more specific? Could it be a dipping sauce rather than a relish? Or could this be the famous (reddish/purplish/brownish) shrimp paste relish (that’s almost always served as a set complete with vegetables)? It may have been a dipping sauce, Leela. The guys were horrified when I dipped a chicken heart in it! They said it was just for the raw vegetables. It was definitely red bean curd and I think it was at a night market just off Chinatown – five years ago. I’d love to know about the famous purple shrimp paste relish – that’s not nam prik gkapi? This definitely wasn’t that. P.S. Also I love how you’re all khlukked and khlukking. I snorted similarly when someone use the phrase ‘wai-ing’. There’s just no other fun way to describe such things! awesome post – as always – LOVE the step by step – nam prik YEAH! I’m so happy to see this post! I’ve recently begun exploring these dishes by searching through thai-language recipe websites and I’m super glad to know that one of my favorite / trusted english-language blogs will soon be helping me out 🙂 My new 3+ cup granite mortar and pestle is on the way; I’m ready to make some nam prik! Great post, Leela. It’s good that these lesser-known dishes, to non-Thais anyway, are getting a mention. I’d like to steer my English friends away from the usual spring roll, green curry and pat thai route, but somehow I’m not sure they’re ready for nam prik kapi yet! I just got back from Bangkok today and your post reminded me that I totally forgot to get my fill of nam prik platu, which my mum used to make, and I used to love. And on the subject of chopsticks – I used to work in a Thai restaurant while I was a student, and every time someone asked for chopsticks I’d want to bang my head on a brick wall. Good job I didn’t! It still makes me cringe to see someone chasing grains of rice around a plate with chopsticks. I continue to be enchanted with your posts, and learning more every day!! I think it’s time for me to visit your “pantry” posts… I don’t usually have access to Chinatown, but I will over the next few months. I love having a well stocked pantry! Leela…. You’re the best! This is absolutely beautiful, I now realize I once ordered this dish in a restaurant, and indeed was a bit at a loss on how to approach it. I was in the store right after reading this, and found some frozen Thai mackerel, but after some googling am still stumped for a relish recipe. I have both small dried shrimp, and flaked dried shrimp. I’m just spitballing here, but if I pound those with some small green chile, fish sauce, lime and palm sugar, will I be on the right general direction? The relish shown here is a little complicated. But the one that should have been here, the one that’s made of shrimp paste, is easier to make. Here’s a very, very, very basic recipe: Pound a large clove of garlic (peeled) in a mortar until you get a smooth paste. Add 1 tablespoon of good Thai shrimp paste and 2 teaspoons palm sugar or 1 teaspoon white sugar; pound again to get a smooth paste. Add 3-4 bird’s eye chilies (more or less, to taste) to the mortar and pound until disintegrated but not pasty. That’s your base. Then season to taste with fish sauce (be careful, because the shrimp paste is already salty) and fresh lime juice. The taste is supposed to be salty first, then sour, with the sweetness in the background just to round out the flavor. More elaborate recipes call for more ingredients, but this basic recipe is a good place to start. Is it sharp and spicy like Indian pickle? Also, do Thais eat this as a snack or a main meal? It looks delicious, but I would probably be hungry again soon after eating this! Oops, just saw that it is a meal in itself. Yup. But to answer your other question, it depends on what goes into each relish. This one you’re looking at doesn’t taste like Indian pickle. You’re hilarious! Your recipes are great & easy. The other element that I always look for when checking out food blogs is how ‘down to earth’ the writer is. Whether a person is a master chef or a beginner…everybody needs someone to relate to and you’ve achieved that here. There’s a wonderfully homey feel to your blog and like every woman knows…nothing tastes as good as the meals prepared at home. Thank you for taking the time to post all of these wonderful recipes and combine them with much love, humor and attention to detail. Here in South Africa (I’m not sure if it’s an international ad) but the one we’ve got running at the moment on telly is when someone accomplishes something really well everybody shouts ‘Give that man a Bells!!’. As in the Old Scotch Whiskey ‘Bells’. We needed to have read this before eating the all relish meal we got in Chiang Mai, where I am pretty sure we barely ate the rice and dipped the veggies in everything LOL. Great post. I moved to Bangkok 4 months ago from Indonesia. I’m Indonesian and we have similar food like this 😀 Indonesian eats plain rice with fried chicken or fish or tempeh or tofu or egg together with sambal. I think sambal is similar with nam phrik. Sambal also made from chilli and mixed with many other ingredients. I am so happy I’ve found your website. I am Vietnamese and we have some relishes/dips that are very similar to the ones you’ve described here. My favorite is one with fermented shrimp or anchovy, pineapple, and a few other things I don’t remember right offhand. We usually use it as condiment to dip boiled pork belly or intestines but I LOVE to eat it with those tiny Thai eggplants (jarred because it’s hard for me to find them fresh) over steamed rice. She made me two jars over the Christmas holiday and I’ve gone through one of them already! I have a feeling she made something similar with mackerel when we were children but I wasn’t too keen on the tiny bones (it was pretty chunky) so she rarely made it for us after that. Now as an adult, I’m more able to deal with those tiny bones so I would love try nam prik pla tu. You describe the texture as cottony – is the fish first prepared like sakura denbu/fish floss? The mackerels are first steamed, deboned, then pounded into something that is very similar to sakura denbu albeit not as dry and fluffy. Thank you for all your posts! Just found your blog and can’t wait to read more! When I lived in Thailand it took me several years to learn to love nam prik kapi, and when I finally came back to the US for a visit, it was the one food I really missed! Now, with 4 years in the US with a Thai husband under my belt, I have learned to make many of our favorites including nam prak kapi but I surely can learn a lot more from you. What is the recipe for dipping sauce. Looks yummy! Excellent post about real Thai food. I think I have been searching for a type of this for a long time, but had no idea what it was or were to start. A friend’s wife who I have lost contact with was from Thailand an gave me a plastic bag of a chunky, paste type substance that was bright red and the most flavorful thing I have ever had! I could have sworn it was made with dried fish but I’m not sure, The only thing she stressed to me was how to eat it, she said “in Thailand most people would have it for breakfast”, I was to mix 1-2 teaspoons of the mixture into a bowl of rice and eat that with either a fried egg or small egg omelet. Unfortunately for me that was all I remembered about the paste/relish. Well that and how great, spicy and flavorful it was!